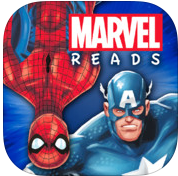 Marvel Origins is a excellent free new iOS app that combines Game Based Learning w/ interactive stories to help develop student Reading skills. The way this works is a person reads along w/ the story (narrated by Stan Lee) as they play interactive games, unlock other stories (i.e. Hulk, Spiderman, etc.) and collect items. This app has high replay value and should help enhance students love of learning reading their favorite comic book heroes. I highly recommend checking out Marvel Origins by clicking here!!! For more info check out Marvel Origins on EDshelf.